Especially during the dawn of the new millennium, Samsung flip phones was the must-have accessory for the teenagers and if you’re a teenager who’s reading this article, you should know that Samsung is bring back the flip phone yet again, as per reports revealed by The Sun. If you didn’t come across this news, you should know that Samsung has designed a shiny premium version of their previous phone, which comes in black color and dons 2 screens and a keypad which contains actual buttons just as the previous days. The name of this phone is Leader 8 and it has got 2 screens and a 12 MP rear-facing camera. What more, it has even got a fingerprint sensor just as the modern day smartphones. This phone is garnering mass attention which surrounds the relaunch of the Nokia classic phone 3310. However, the Samsung blower will be given sale only in China and there’s no news about when it is going to launch in Australia and America. Nevertheless, it is most likely that the handsets will be available online shortly and in case you’re someone who’s eager to pay for worldwide shipping charges, you can even place your hands on them. But Samsung has not yet confirmed the price of the handset. 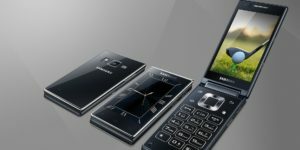 This is in fact the second Samsung flip phone of 2017 which is about to come from China and their Chinese telecommunication authority TENAA and they had displayed yet another model earlier in 2017. Samsung revealed its Leader 8 or SM- G9298 and they announced the phone with beastly specifications. The specs include a Snapdragon processor 821, RAM of 4GB, expandable storage of 64 GB, camera of 12 MP and battery of 2300mAh. The features which were added new to this phone were the fingerprint sensor and a 2300mAh battery. One of the coolest features of the Samsung flip phone is its ability to be operated as a touchscreen phone even when it isn’t opened or flipped open. Since it has got 2 4.2 OLED displays, you can use the touchscreen in this way. So, doesn’t that seem an awesome opportunity? If you want to text to your friend or use the other apps, you will have to flip it open and you will also feel the top screen locking in its place. The Snapdragon 430 chipset within the phone will make you get sceptical about its performance but since Samsung has packed 4GB RAM and an external storage of 64 GB, you will feel like a powerhouse which you had been hoping for. The only issue is that the apps might work slowly and it is also a poor option for gaming. But keeping in mind the other features, this is definitely a must-have especially for teenagers who have been pestering their parents for a high-end smartphone. Samsung has not been scrimped on their usual top features like wireless charging, fingerprint scanner and Samsung Pay as all of these are in-built within the phone. However, it doesn’t have the Bixby smart assistance or the Galaxy S8’s iris scanner. If you think you can live without these features, you can go for this. During a time when majority of the top-notch phones look identical to each other, it’s good to see how Samsung is pushing its top specification devices in its entire form. It has been noticed off late that there is a hype and excitement about old form devices. The web went berserk with the announcement of Nokia 3310 even though it is a low-spec phone. So, Samsung is sure to get famous with this phone.